A sampling of the four plutonic stages of the New Hampshire series. This encompasses the Bethlehem Gneiss, the Kinsman Quartz Monzonite, the Spaulding Quartz Diorite and the Concord Granite. The rocks cover the Mascoma, Sunapee, Mt. Kearsarge, Penacook, Hillsboro, and Concord Quadrangles. The ages of the series range from 359-411 Ma. This paper describes the formation of each of the four series in the New Hampshire magma series. 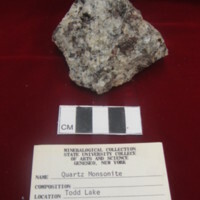 This paper describes the formation of the Kinsman Quartz Monzonite in detail. This thesis details the emplacement, formation, and petrology of the Spaulding Quartz Diorite. Lathrop, A.S., Blum, J.D., and Chamberlain, C.P., 1996, Nd, Sr and O isotopic study of the petrogeneseis of two syntectonic members of the New Hampshire plutonic series: Contributions to Mineralogy and Petrology, v. 124, pp. 126-138. This paper describes the elemental and isotopic analyses of the New Hampshire magma series in order to better understand the petrogenesis of the suite. This paper uses Rb-Sr isotopic analyses in order to age date the four different members of the New Hampshire magma series. OCR PDF of supplemental information for the Plutonic Magma Series- Southwestern New Hampshire collection. 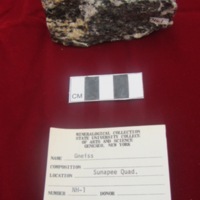 Gneiss from the Bethlehem Gneiss series. Thin section contains plagioclase, alkali feldspar, biotite, quartz, and muscovite. 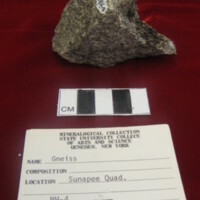 Hand sample contains feldspars, quartz, and micas. 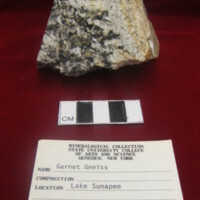 Gneiss from the Bethlehem Gneiss series. Coarser grained. Thin section contains biotite, muscovite, quartz, plagioclase, and alkali feldspar. 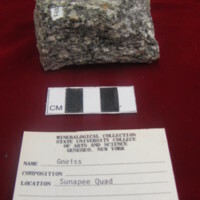 Hand sample is coarser than NH-3 and contains quartz, feldspars, and micas. From the same locality as NH-4. Gneiss from the Bethlehem Gneiss series. Thin section contains biotite, muscovite, quartz, and plagioclase. 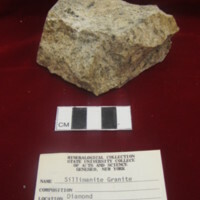 Hand sample is finer grained than NH-3 and contains feldspars, quartz, and micas. From the same locality as NH-3. Granite from the Concord Granite series. Thin section contains plagioclase, alkali feldspar, biotite, quartz, and muscovite. Hand sample shows feldspars, quartz, and micas. 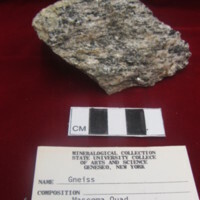 Gneiss from the Bethlehem Gneiss series. Thin section contains quartz, biotite, plagioclase, and muscovite. Hand sample is a leucocratic facies and contains quartz, feldspars, and micas. Leucocratic facies of the Kinsman Quartz Monzonite. Thin section contains plagioclase, bitote, quartz, alkali feldspar, and muscovite. Hand sample shows feldspars, quartz, and biotite. Taken from the same location as NH-7. 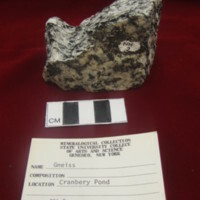 Granite from the Spaulding Quartz Diorite. Thin section contains plagioclase, biotite, quartz, alkali feldspar, some garnet, and sillimanite. Hand sample shows quartz, feldspars, sillimanite, and mica. 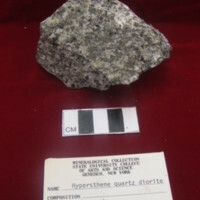 Hypersthene Quartz Diorite from the Spaulding Quartz Diorite. Thin section contains pyroxene, quartz, biotite, plagioclase, and alkali feldspar. Hand sample shows micas, quartz, feldspars, and pyroxene. From the Concord Granite. Thin section contains plagioclase, potassium feldspar, quartz, biotite, and muscovite. 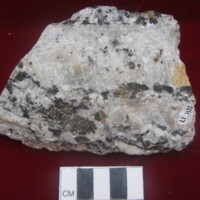 Hand sample is finer grained and contains feldspars, quartz, and micas. 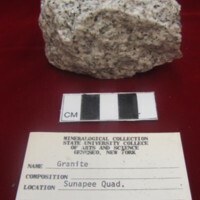 Coarse grained sample from the Concord Granite. Thin section contains plagioclase, potassium feldspar, quartz, and muscovite. 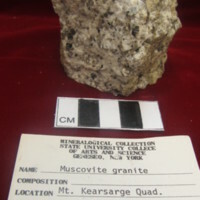 Hand sample is a coarse granite with quartz, feldspars, and muscovite. 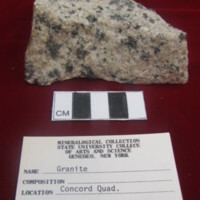 Relatively coarse facies from the Concord Granite. Thin section contains plagioclase, potassium feldspar, quartz, muscovite, and biotite. 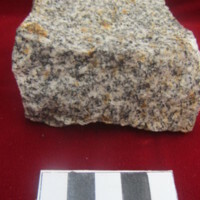 Hand sample is a coarse-grained granite with quartz, feldspars, and micas. 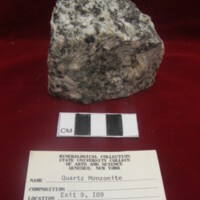 Quartz Monzonite from the Kinsman Quartz Monzonite unit. Thin section contains lots of plagioclase in addition to biotite and quartz. 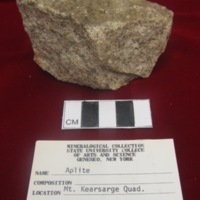 Hand sample contains feldspars, quartz, and biotite. 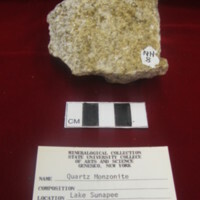 Quartz Monzonite from the Kinsman Quartz Monzonite unit. Thin section shows quartz, potassium feldspar, plagioclase, biotite, muscovite, and myrmekitic texture. 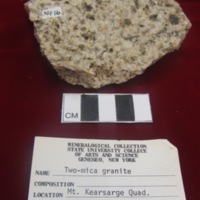 Hand sample contains quartz, feldspars, and micas. 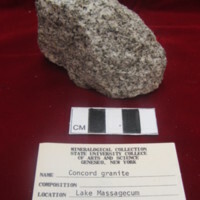 Granite, dark facies, from the Concord Granite. Thin section contains quartz, plagioclase, potassium feldspar, and biotite. Hand sample shows lots of quartz and feldspars with dark biotite.